This park is mostly mown grass, used as playing fields. These landscapes are often known as ‘Green Deserts’, because they support only a very small amount of wildlife. However, there are 6 areas of new woodland planting, with a few mature trees scattered over the park. The trees that have been newly planted (as part of the Edinburgh Urban Forest Project) are all native and are a mixture of broadleaves and conifers. They include Oak, Ash, Scots Pine, Larch, Birch, Rowan, Holly and Hawthorn. There are several distinct mature trees in the park. The first is the group of eight Scots Pine trees, near the Jack Kane Centre, on the way to the Wisp. They stand out because of their shape – tall trunks with an explosion of pine needles at the top. Also, the plated bark of these trees usually gets redder towards the top. Scots Pine trees were known as the King of the Forest. They once covered much of Scotland, in the ancient Caledonian pinewoods. Because they are evergreen, they symbolised life and immortality, and the pine cones were a masculine fertility symbol! Nearly every part of the tree was used for something. The resin was mixed with pig fat and bees wax and made into a healing ointment for sores, or mixed with varnish, paint and tar in order to waterproof wooden boats. The bark was used to cure fevers, the buds to counteract scurvy and the resinous roots were used as candles, before they were replaced by oil lamps. The roots were also beaten and their fibres used to make ropes. The timber was used for building houses and boats. The main Caledonian Pine forests of today exist in the central Highlands – around about Aviemore - and they support a rare and specialised wildlife, including Scottish Crossbills, Siskins, Redpolls, Chaffinches and Red Squirrels. As well as deer, of course! 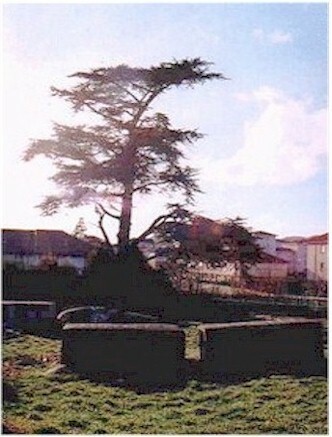 Beside the Gulliver (play equipment on the ground in the shape of a huge man) are another two very distinctive trees. The one next to the fence is an Atlas Cedar. The name tells us that this tree comes from many miles away - from the Atlas Mountains of Algeria and Morocco. The other large tree here is a Sycamore. This particular tree is very badly burnt down one side, although it is surviving. The Latin name for Sycamore is Acer pseudoplatanus. The ‘Acer’ part means it is a member of the Maple family (which all start with ‘Acer’ - this means ‘sharp’). The ‘pseudo’ part means ‘false’ and the ‘plantanus’ part means ‘Plane’ tree. All this together tells us that Sycamore is a ‘false Plane tree’ – and it does look like one! This is not a native tree to Britain, but does very well on our soils and in our climate – often in places where other trees find it difficult to grow. Because they take root easily and grow well, they tend to shade out other trees and native vegetation underneath … not so good for our native wildlife. However, being a member of the Maple family, it has a very tasty sap, which can be tapped and boiled up to make a syrup similar to Maple syrup! It also produces a very useful wood. The seeds of Sycamores have ‘wings’, which allow them to float to a suitable spot to take root. These seeds are called ‘helicopters’, because of the way they spin round in the air. Many Sycamore trees have black spots on their leaves. This is a fungus called ‘Tar Spot Fungus’. It usually appears on trees that have grown in relatively unpolluted areas. The nectar-rich flowers appear in clusters in spring. They are particularly attractive to bees, which can be heard buzzing round the tree canopy, sounding like distant motorbikes! Still in the Park, down by Niddrie Burn (number one channel, re-emerging) there is a large Lime tree right next to the water, by Niddrie House, with many sprouting shoots coming out from the bottom of its trunk. Further down the Burn are many mature Sycamores and about five Horse Chestnut trees beside the bridge. This species of tree is not native to Britain. These trees are left over from the Niddrie House Estate. Horse Chestnut trees have huge, sticky buds in winter and then large leaves that look a bit like bulbous, spread-out hands, in summer. (Each leaf has about 5 leaflets, all joined at the base.) And, of course, they give us conkers in the autumn time! Because they aren't native, they don’t support as many different kinds of insects as native trees. White/pink flowers of Himalayan Balsam by Niddrie Burn. Gorgeous smell. SpikyTeasel seed-heads (look like hedgehogs) on long stalks in tree plantation next to main road.